Government continues to promote development within the public sector as it approved a number of overseas training programmes to be attended by members of the public service. According to Minister of State, Joseph Harmon, government is embracing these training programmes so public servants can be exposed to international best practices. He made this known during the Post Cabinet Press Conference on Friday. He added that the quality of supervision that is to be executed by these employees should see improvements. The Minister said that capacity building, though done by external training, is also being done with internal training, whereby local resources are utilised. In some cases, persons are brought from abroad to train local public servants. 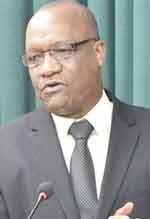 In his statement on issues discussed by Cabinet, Harmon informed the media of a number of overseas training programmes which government gave its approval. Guyana is to be represented at the first Added Tax Initiative Conference on Tax and Development to be held in Berlin, Germany. This conference will be from June 14 to 17, 2017. Harmon said that Guyanas representative will be Commissioner General of the Guyana Revenue Authority, Godfrey Statia. The initiative for the conference was launched at the third Financing for Development Conference that was held in Addis Ababa, Ethiopia in 2015. The aim of that programme was to improve transparency, efficiency and effectiveness in national tax systems. Further, Harmon said that Guyana will attend an international taxation network meeting organised by the Inter-American Centre for Tax Administration to be held in Cartagena, Columbia from July 4 to 7, 2017. He said that this meeting seeks to promote the harmonisation of tax practices in Latin America and Caribbean countries and to generate and analyse a database of international tax planning. Representing Guyana at this meeting will be Deputy Commissioner General of GRA, Ms. Hema Khan. Immigration management is expected to see improvements since the country will be represented at a training workshop for Immigration and Customs Border Officials to be held in Barbados from June 13 to 14. According to the Minister, the workshop that is organised under the European Development Fund/CARICOM Single Market and Economy Integration programme, will seek to clarify the roles and functions of border, immigration and customs officers with regards to the CSME, particularly as it relates to the free movement of persons within the region. David Hermonstyne of GRA and Mr. Eworth Wray of the Central Immigration Office will attend that workshop. Cabinet also granted approval for participation in a meeting on the governance of migration to be held in Geneva, Switzerland from July 18 to 19, 2017. This second international dialogue on migration organised by the International Organisation for Migration (IOM) will assist participants to understand migrant issues, vulnerabilities from the policy perspective to ensure the protection of the rights and wellbeing of migrants. Mr Michael Brotherson, Head of the Diaspora Unit in the Ministry of Foreign Affairs will attend that meeting. Guyana will also attend a meeting of CARIFORUM Officials on Trade in Service under the CARIFORUM/EU Economic Partnership agreement on June 22, Kingston Jamaica. The Minister said that this meeting will consider the impact on European Visa requirements and the ability of CARIFORUM service suppliers to enter and sustain their presence in the EU market. Senior Foreign Service Officer in the Ministry of Foreign Affairs, Mr Sherwin Naughton, will attend that meeting on behalf of the state.